A new addition to the Baby Pod family, coming in 2014, is the Evac Pod PICU/NICU evacuation unit. 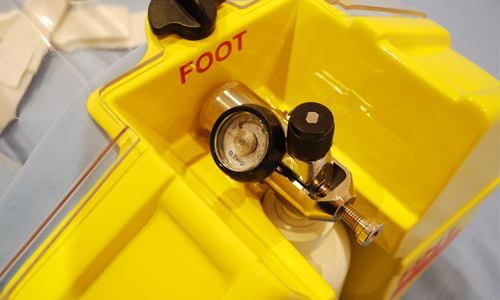 Intended for use in the event of a fire or natural disaster affecting a hospital, the Evac Pod is used for transport of patients within PICU/NICU or maternity wards in the event of a ward or hospital emergency evacuation. The Evac Pod incorporates a single-use cylinder of medical air into the external shell of the unit, that once activated provides a constant air flow of 4 litres per minute into the patient compartment, providing a positive pressure environment inside the Pod itself. This prevents the ingress of any smoke or fumes into the Evac Pod compartment, protecting the infant, and providing clean air to breathe. The lightweight materials used in construction of the shell and other components, and the compact size of the unit mean that it can easily be handled by a single carrier, making Evac Pod the quickest and most lightweight means of evacuating patients from an PICU/NICU during an emergency. Also featured within the Evac Pod are some of the main features of our original Baby Pod II design. The structure and shape of the shell make it incredibly resistant to any knocks or bumps, protecting the patient from initial impact. The foam interior of the patient compartment is layered with the same shock absorbent materials that absorb the impact of a potential crash in the Baby Pod II, and therefore give the patient a soft and comfortable environment in which to be carried.